Clear vinyl and plastic Lanyards are an alternative to synthetic or cloth lanyards. Now, despite the fact that they are indeed an “alternative” to the traditional lanyard they are well received by customers worldwide. Stylish and eye-catching they provide the perfect area for commercial display, the clear surface offering a different touch to the commercial. Every commercial gives us a feeling even if we are not aware of it, our brain processes it and a clear surface it’s often received as being more professional compared to a colored one. Hence the reason why many people that have to wear suits or some sort of uniform on their jobs usually opt for these types of lanyards. An increased number of workers from the industrial area also prefer these lanyards because they do not conduct electricity. When they get wet, both the cloth and the synthetic lanyards conduct electricity because water is retained in their tiny small gaps of breeding. In pure form water is an electric isolator, but this kind of water does not exist in nature, and the water that does exist in nature is impure and filled with metal particles therefore making it an electric conductor. Because the surface of a vinyl and plastic lanyard is very smooth and because is made out of a material that does not absorb water is the reason why these lanyards do not conduct electricity. Vinyl Lanyards are more expensive and are perceived as having more value than the cloth lanyards. A clear lanyard will wear slower. That is a fact. The clear and smooth surface will make stains either get washed or hardly noticeable compared to a traditional colored lanyard. Having all these facts it is easy to deduce what kinds of people prefer these lanyards the most. They are usually, but not necessarily, working in fields that operate with electricity and high voltage or they wear suits or uniforms on their jobs. People like: electricians, contractors, high-end corporate executives, bank employees & tellers, home service technicians, restaurant workers and many others have a great use of clear vinyl and plastic lanyards. How can we offer many styles of lanyards at such low cost? Because we are only domestic company that can bring you TRUE factory direct lanyards and that mean lowest price for you! We are the cheapest source for printed badgeholders and retractable badge reels also. Anywhere... guaranteed! Compare and save. Our cutting factory is ISO 9000 certified so your clear plastic lanyards quality and speed production is affirmed and guaranteed. 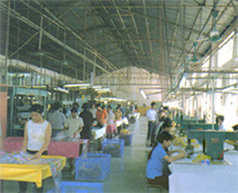 We have full cutting facility and also produce tote bags, backpack, fanny pack and other quality items. We have been in business for over 15 years. Whether your order is for 50 pcs. or an entire 20-foot container, nobody can beat our lanyards direct pricing and acclaimed graphics help and customer service. Our domestic U.S. customer service will be help you with your vinyl lanyards order. LanyardStore.com offers clear to slight color tinted vinyl lanyards for the maximum promotional efficiency. These lanyards are among the most if not the most professional lanyards you can buy. Everyone wearing a suit will most likely opt for such a lanyard. 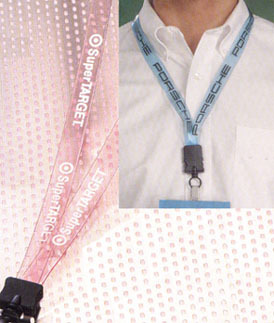 The clear lanyards do not stand out as aggressively as other types of lanyards and some marketers would choose other types of promotional items that may work better for their particular strategies, but if you are aiming at customers from the upper class, who dress up in suits all day you might as well seriously consider clear plastic vinyl lanyards. It’s not always about how visible your logo is, sometimes the more subtle messages are the ones that get the most interest. It really depends on what type of customers you are targeting. Teenagers and lower classes generally notice the flashy lanyards such as the ones made out denim, cotton or nylon. There are many circumstances where clear plastic vinyl lanyards are significantly more effective. Nonetheless, even if your average customer is a teenager given them the option to opt for this particular type of lanyard is a strategy that is very effective on the long run. Customers love to have a choice. They don’t like to have many choices because they will leave them confused, but if in your giveaway campaign you offer them the option to choose between multiple types of lanyards, that will most definitely work in your favor. Unlike nylon, vinyl feels softer and a little bit more comfortable. LanyardStore offers the cheapest vinyl lanyards on the web. Compare us to other manufacturers and you will see the price difference. In order to really take advantage of the low price offered by LanyardStore order bulk vinyl lanyards and significantly reduce the price per lanyard. A clear lanyard will preserve its quality appearance for a longer period and the fact it doesn’t conduct electricity it makes it a perfect item for workers such as electricians and also for people that wear suits or uniforms at their jobs. Let us work for you. Order bulk vinyl lanyards from The Lanyards Store today! For all lanyards compare our prices to anyone! Click here for our lowest priced lanyard! Offers personalized lanyards as low as 20 cents. We are also the cheapest source for printed badgeholders anywhere - guaranteed. Compare and save. We urge our customers to order early and allow proper lead time. Please see our help/faq section for further info on ordering and lots of good advice. Call our Vivienne Sands for fast customer service. Whether your order is for 72 pcs. or an entire 20-foot container, you'll find that nobody can beat our manufacturing-direct pricing. Many times, we are less than half the amount of our competitors! In addition, you'll also find that our acclaimed graphics dept. and customer service is next to none. We are experts in the making and delivery these printed items. We also export to anywhere in the world. Offers personalized lanyards as low as 20 cents. We are the cheapest source for printed badgeholders anywhere - guaranteed. Compare and save.